Despite the fashion for replanting, many old vineyards remained across California. They were planted with Zinfandel, and a mix of grape varieties brought by Italian immigrants. Most of these older vineyards were dry farmed (not irrigated), with deeply rooted vines. Some winemakers—older ranchers and their children, as well as newcomers—valued the fruit on older vines that produced fewer grapes, but with more intensely concentrated flavor. They sought out old vineyards, and planted new fields with old varieties. Aldo Biale used this punch, made from a tree branch, to feed grapes into the crusher. He also wielded the tool to punch down—break through—the cap of grape skins that mass at the top of a batch of Zinfandel during fermentation in an open-top vat. 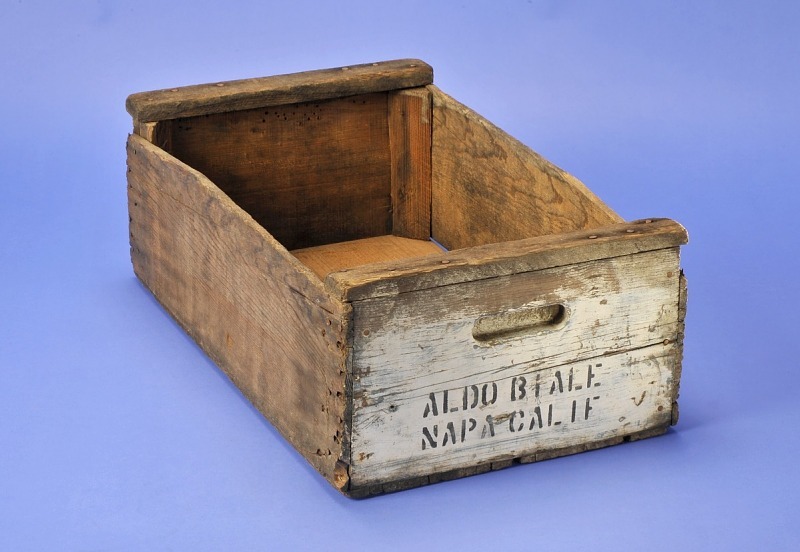 This old wooden picking box was used to harvest Zinfandel on the Biale Ranch for many years by Aldo Biale and his family. The Biales still use the old wooden picking boxes on special occasions. Gift of Clementina Biale and Robert Biale. Aldo Biale and his son Bob feeding Zinfandel grapes into an old crusher suspended over a modern two-ton bin. The wine made from this small batch, labeled Bravo Aldo, was a tribute to Aldo, who died in 2009.